Filipinos have an unerring taste for anything romantic, especially when it comes to music. It comes to no surprise, then, that there is a huge demand for popular American R&B vocal group Boyz II Men to perform again on Philippine soil. The vocal group, composed of baritone Nathan Morris and tenors Shawn Stockman and Wanya Morris, is set to serenade Filipinos on September 17, 2014 at the Smart Araneta Coliseum. Known for their soulful ballads, catchy R&B tunes, and a cappella covers, Boyz II Men has broken many records in the music industry, even overthrowing The Beatles and Elvis Presley’s record of longevity in the No. 1 spot of the Billboard Hot 100. “One Sweet Day”, the group’s collaboration with Mariah Carey, still holds the record as the longest running and most successful number one song as it stayed on Billboard's top spot for 16 weeks. Here are just some of the hits that we’d love to hear and fall in love with all over again on September 17. Ask any fan of Boyz II Men for his/her list of favorites, and this breakup song will surely come up. Ask any heartbroken person about songs that embody his pain and regrets, and he'll definitely name this one. How could you go wrong with “I'm gonna swallow my pride/ say I'm sorry/ stop pointing fingers, the blame is on me”? We could think of lists that “On Bended Knee” would probably be perfect for, and we'd still put it on a high spot, if not the top. Aside from its emotional punch, this single also broke records for the band in 1994 when it stole the top spot from the group’s other single “I'll Make Love to You” on the Billboard Hot 100, making them third (after The Beatles and Elvis Presley) to replace themselves at number one. The vocal group was already making waves in the United States when they released their first album in 1991, but it was “End of the Road” that catapulted them to international success in 1992. The single became the first Boyz II Men song that dominated the Billboard Hot 100 for 13 straight weeks, only to be beaten by Whitney Houston's “I Will Always Love You”. “End of the Road” also topped the charts in Australia, New Zealand, United Kingdom, and the rest of Europe in the same year. The song is so popular that it has been covered by many artists such as Backstreet Boys, We Are Scientists, Gladys Knight, and even U-KISS, a South Korean boy band. If we could make a soundtrack about sweet, romantic seduction, this would be included. What kind of girl would not be won over by lyrics that go, “Pour the wine/ light the fire/ Girl your wish is my command/ I submit to your demands/ I'll do anything, girl you need only ask”? “I'll Make Love to You”, written by Babyface in 1994, stayed on the Billboard Hot 100's top spot for 14 solid weeks before it was replaced by another Boyz II Men single, “On Bended Knee”. The single also won the Grammy Award for Best R&B Performance by a Duo or Group with Vocals and two American Music Awards for Favorite Pop/Rock Single and Favorite Soul/R&B Single in 1995. At present, the song sits at No. 17 on Billboard's All Time Top 100. Boyz II Men continually proved themselves the master of R&B songs about breakups. They couldn't stop with two earlier hits that they had to come up with this one in 1995, which showed just how dry and drained we all feel after trying hard so many times. In the end, however, there's still a nudge with the lines “Let's don't wait till the water runs dry/ We'll make the biggest mistake of our lives/ Don't do it, baby”. Penned again by Babyface in 1995, the single peaked at No. 2 on Billboard's Hot 100 and reached the 24th spot in the United Kingdom. The song was also given an acoustic treatment when it was covered by Boyce Avenue in 2010. They're more known for their soulful, heartbreaking songs for the longest time, but Boyz II Men actually debuted with an upbeat new jack swing in 1991. “Motownphilly” is about the boys' humble beginnings in high school and tells how they hope to make it big as they learn how to groove under the spotlight. The debut single peaked at No. 3 on the Billboard Hot 100 and featured rap singer and New Edition founder Michael Bivin, who co-wrote the song. Not bad for a debut at the time. Listening to it live would be a breath of fresh air, especially after the more emotional ballads. It’s hard not to be impressed by the smooth and slick flow of “Four Seasons of Loneliness”. We don’t even experience the four seasons here, but the descriptions of winter, spring, summer, and autumn are so clear that we easily understand how they fit so well with love, from its sweet beginning to its bitter end. It feels even more intense when we see the video, complete with its breathtaking scenery. The song reached Billboard's No. 1 spot again in 1997, becoming the group's fourth chart-topper. 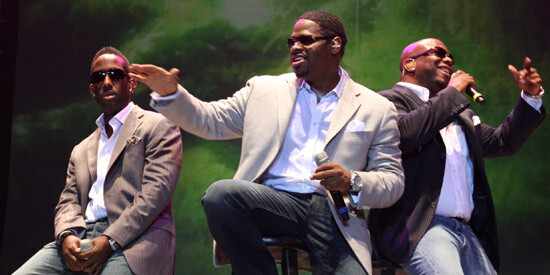 Boyz II Men is also praised for their covers of other great hits, and “I Can’t Make You Love Me” shows why it should be an honor for any artist to get his or her song performed by the vocal group. The Bonnie Raitt single released in 1991, originally of country pop and blues rock style, was given the distinct R&B treatment by Boyz II Men in 2009, earned great reviews from critics, and earned a good spot on the Billboard's Hot R&B/Hip-Hop Songs chart. The group’s tribute to mothers is one of the most touching songs written of its kind, with no-nonsense lyrics and a chorus that we love to sing to our moms: “Mama, mama, you're the queen of my heart/ Your love is like tears from the stars/ Mama, I just want you to know/ Lovin' you is like food to my soul”. The song, originally written for the 1997 comedy-drama Soul Food, peaked at No. 7 on the Billboard Hot 100. Love transcends color and race, and “The Color of Love” from the album Full Circle tells exactly that. The vocal group even traveled to Ghana, Japan, Puerto Rico, and India in 2002 to shoot their segments separately for the music video, which showed people from different cultures show the many facets of love. When it comes to inspiration, Boyz II Men has “I Will Get There” to offer. The song, which was written for the soundtrack of the film The Prince of Egypt in 1998, captures the aspirations of a person to get to where he wants to be, despite the odds. “I Will Get There” also became a Billboard hit, and its a cappella version even reached No. 32 when it was released as a single. PEPsters, what are your favorite Boyz II Men songs? Share your thoughts in the comments section below.